Depending on which of the above you click on opens up various options to your left. Under Photo Print, you have various printing options, including still photo, Movie print, a calendar, etc. On the right hand side of my desktop, I noticed a new widget with four options; Layout Print, Photo Print, Show Main Screen (which is the one displayed above), and Hide Shortcut menu. This is a handy little widget that allows you to quickly start printing, and I was glad to see a hide option. 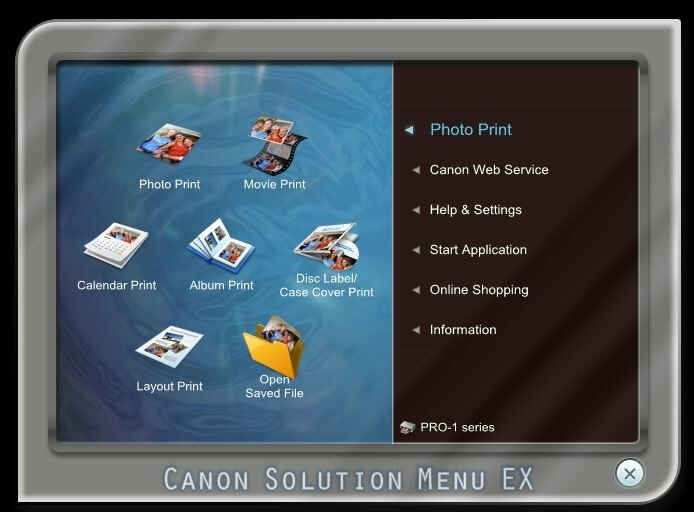 Selection the Photo Print option from either the main menu or the shortcut widget will bring up the Canon Easy-PhotoPrint EX software. Within just three steps you can be on your way to printing photo lab quality prints. The first screen gives you a file tree on the left for you to navigate to the folder that contains the photos you want to print. On the left is an explorer type window with thumbnails of you photos. Clicking on a thumbnail will add it to the queue along the bottom, and under each thumbnail is a counter that allows you to choose how many prints of that particular photo you want printed. Next you need to choose the paper size and media type. The available media types on the right all depends on what you choose on the left. 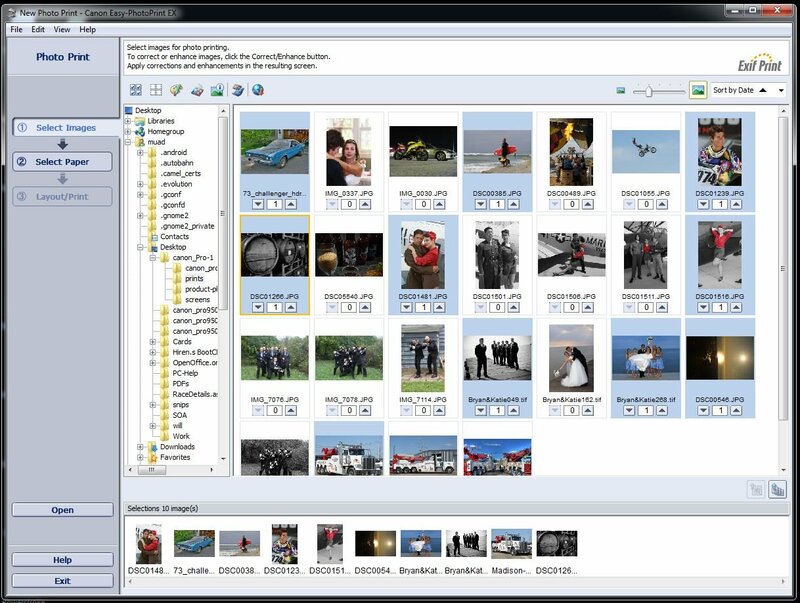 Once you've selected the files and the media properties, now you choose the layout. You can choose bordeless, bordered, Index options, etc. You can also preview each photo by clicking on the thumbnails in the queue below. The order that the photos are displayed in the queue below is the order in which they will be printed. Once you've made all of your selections, be sure that you have the correct paper in the printer, and click the Print button to begin. At any time you can jump back to the previous pages to change the paper type, add/remove images from the queue, etc. 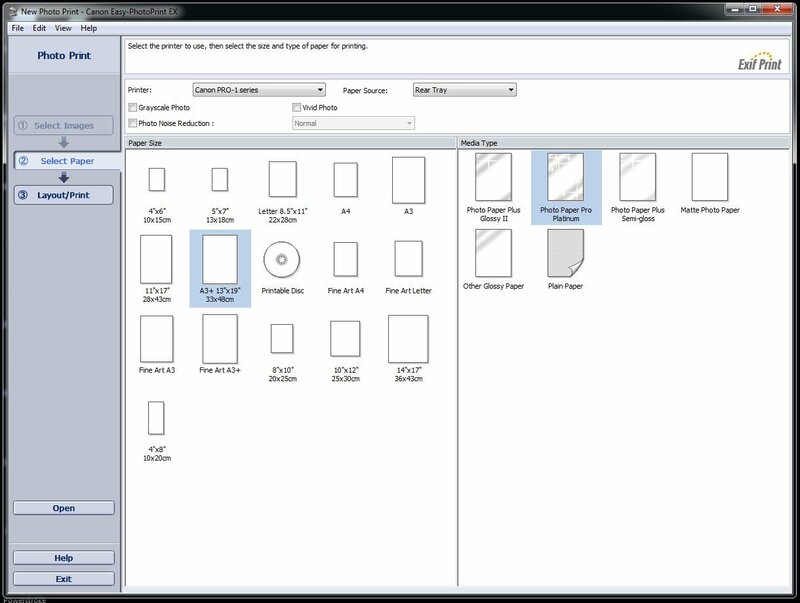 While the Pro-1 prints your masterpieces, the familiar dialog/status box is shown with information on which print of the total pages is being printed, ink levels, etc. Canon's PIXMA Pro-1 is a professional series ink-jet printer that is designed for a wide variety of photogs. Whether you're a seasoned professional or a budding semi-pro, the Pro-1 gives you the ability to display your work on your own walls, present it to clients, or the local photo gallery with quality that meets or exceeds your local or online photo lab. The Pro-1 succeeds the Pro9500 Mark II, which some worthy upgrades; namely the new tubular 12-ink system, 2.5x larger ink tanks, and the addition of 5 new monochrome inks (Photo Black, Matte Black, Gray, Dark Gray and Light Gray). While the Pro-1 takes up quite a bit of desk real estate, it does so with style thanks to its blocky, yet sophisticated exterior. Like all of Canon's PIXMA models, the Pro-1's rear feed and front paper trays fold into the body, giving you a that compact appearance, which is helped with its black and dark grey color scheme. This combination makes the Pro-1 appear to be much slimmer than it really is. Weighing in at 60+ pounds, you need to make sure you have a beefy table or desk to hold the printer up. We also recommend you have someone lend you a hand when initially unboxing the printer, or anytime you plan on moving it. I wasn't fortunate enough to have help, and my back was not happy after lugging this thing to my office and unpacking it. Setting up the printer and installing the driver and Canon software was simple and straight forward. Thank to the handy Getting Started guide that's supplied with the Pro-1, anyone can easily setup this printer. 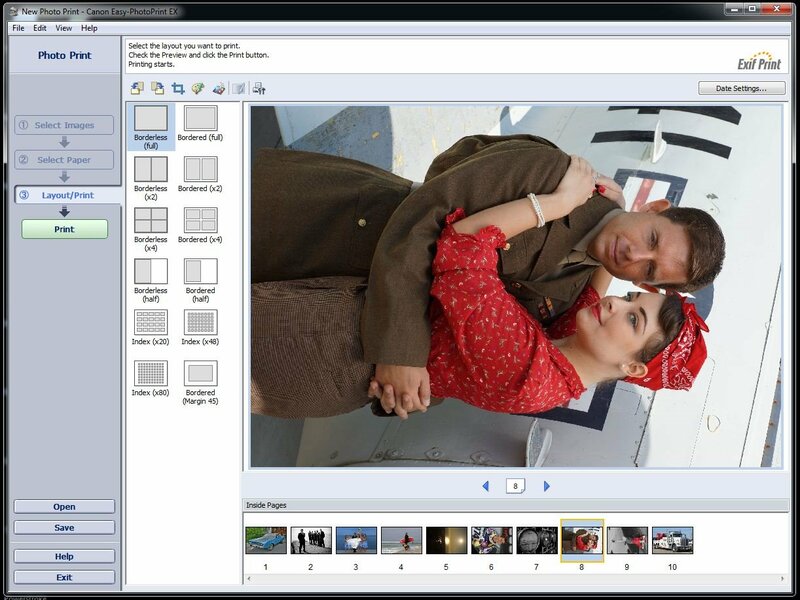 It took us about 45 minutes to an hour to setup the Pro-1 from start to finish, however this time included taking some of the product photos, along with the screen captures needed for our Print Driver and Software pages. So, the typical person should have no problem setting up the Pro-1 in about 30 minutes or so. With the Pro-1 using Canon's FINE (Full-photolithography Inkjet Nozzle Engineering) Technology, the print head is able to deposit precise and constant 4 picoliter ink droplets, and thanks to the large auto and manual feed tray, it can create photo lab quality prints of remarkable quality on a wide variety or print mediums; including Fine Art paper. The 12-color LUICA ink system provides a color gamut that is unmatched by any other printer in this price range in our opinion, and the new Monochrome ink set produces rich blacks, greys, and metallic tones. Lastly, Canon's Chroma Optimizer helps ensure your prints are the best that they can be by reducing any differences in ink droplet dimensions, giving you a more uniform pattern that appears flatter and smoother. This helps the print to more evenly reflect light, which enhances the entire image. While we believe that print quality and cost are the most important aspects to consider when looking at a printer, speed is also important. The Pro-1 claims to be a speedy printer, and for the most part that seems to be true. However, Canon made claims in the Pro-1's press release, and on their website, that the Pro-1 can spit out a 13x19-inch (bordered) print in just 4:20. We were not able to reproduce that time, however we got pretty close. Either way, the Pro-1 can churn our some amazing prints in no time at all, however it's not going to win and land speed records. Below is a break down of the timing results we achieved using various paper types and sizes, printing full resolution images from my personal Canon EOS 50D, Sony's SLT-A77, and NEX-5N. Bottom line - Canon has created a very appealing large carriage printer with their new PIXMA Pro-1. This printer would make an excellent choice for both professional and semi-pro photographers, and even those enthusiasts with deep pockets. During our tests, the Pro-1 was able to produce stunning prints from 4x6 inches all the way up to borderless 13x19s, with color saturation and black density that is unmatched in this price range. While this printer is no slouch, our timing test results were a bit slower than past models we've tested; which comes as a surprise to us since the ink tanks no longer ride on the print head, thus shedding some additional mass. The PIXMA type body is stylish, and uses the same compact technology that we've become accustomed to from this line of printers, with the printer folding up into itself leaving you with a stylish cube on your desk when it's not in use; well rectangle actually. Furthermore, with a MSRP of just $999 USD, which includes ink, the Pro-1 is quite affordable when you consider the output quality of this rig. Not to mention the ink tanks are 2.5 times larger, while not being 2.5 times more expensive; on average, we found the individual tanks for $35 online. That said, we give the Canon PIXMA Pro-1 a glowing recommendation for anyone who's looking to create photo lab quality prints from their own home or office, while not breaking the bank with the initial investment.